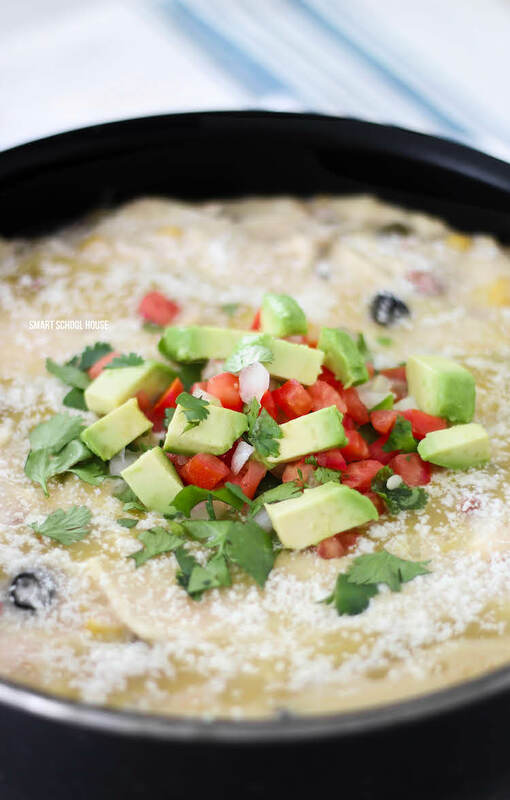 It’s always a great idea to add this creamy chicken enchilada skillet recipe into the mix of weeknight dinners because it is a delicious and filling meal for the entire family. This one pan dinner recipe is easy to whip up in a hurry and it’s an irresistible home cooked meal that is perfect for busy days. 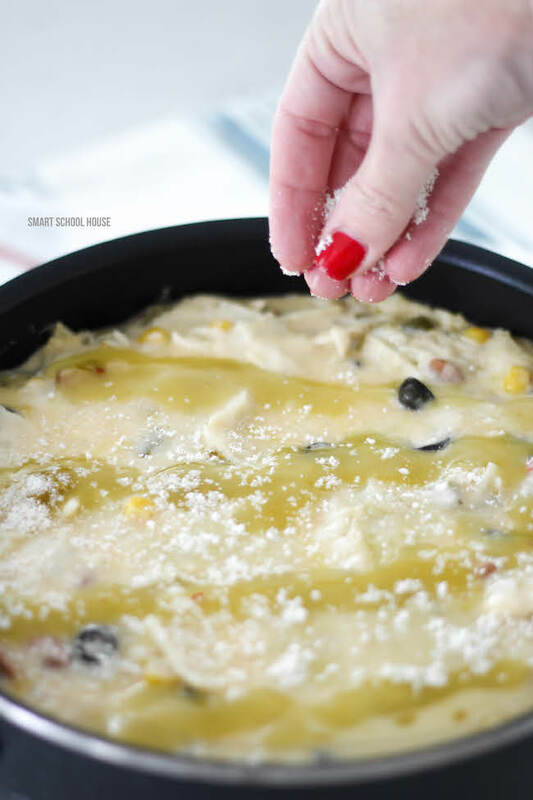 We love making crock pot recipes or casserole dishes on cold days. However, we’re up for a tasty Mexican inspired dinner any day of the year! What I love most about this dinner (other than how great it tastes) is that it’s all cooked in one dish. Less clean up, more relax time! Mexican food is our favorite and we can’t ever get enough! We love tacos, burritos, taquitos, and especially enchiladas. 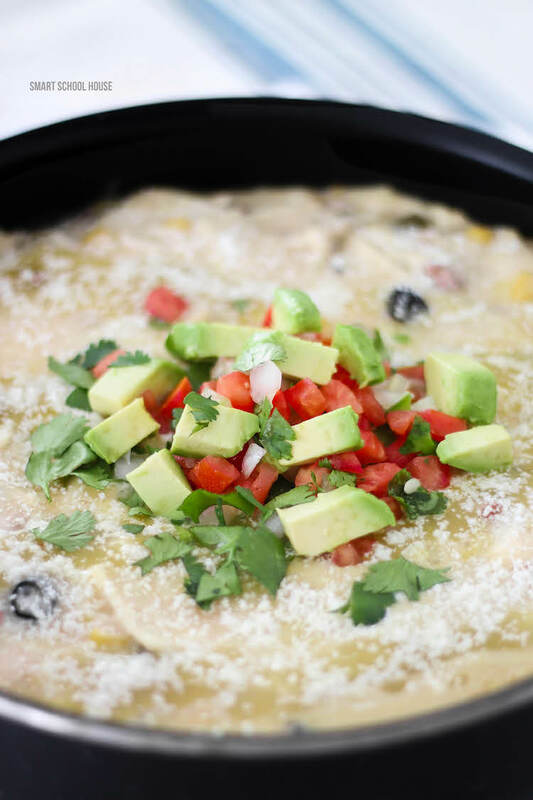 This recipe tastes like traditional enchiladas without all the work and that makes it a great go-to recipe for our family. 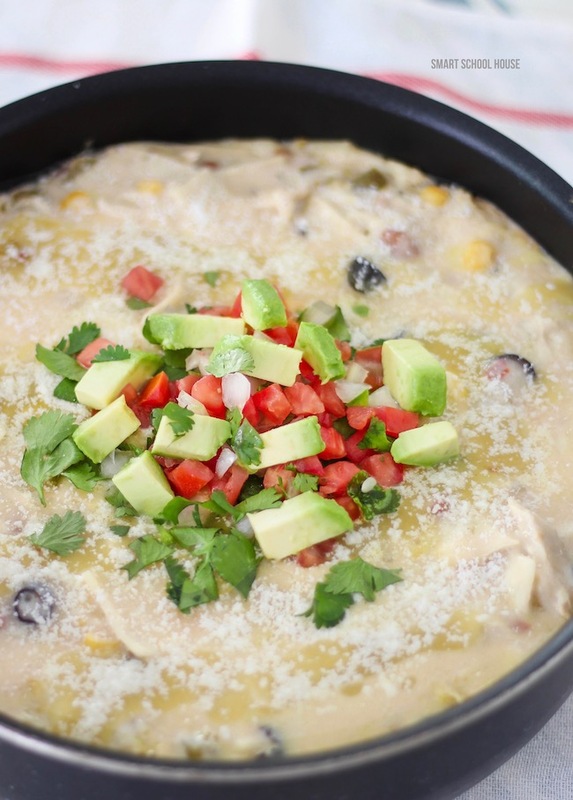 They are extra creamy because of the sour cream green enchilada blend which is mouthwatering! 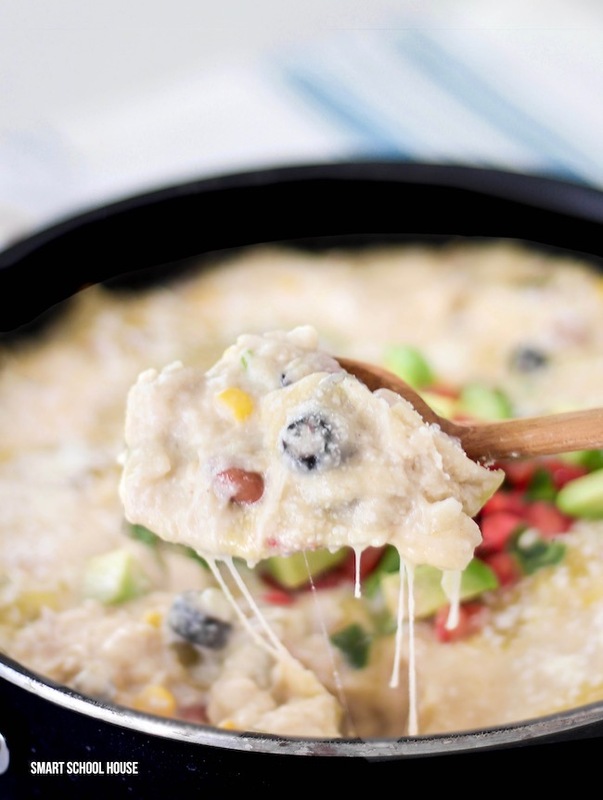 Unlike traditional enchiladas, this enchilada skillet recipe includes beans and corn. It’s a full meal all in one pan! How’s that for easy? The top of the bubbly cheesy enchiladas is a warm drizzle of more green enchilada sauce and Cotija queso (cheese). I like to garnish it a little with fresh cilantro in addition to pico de gallo and sliced avocado. Not only does it make the skillet dinner look amazing but also gives it wonderful texture for the perfect final touch. 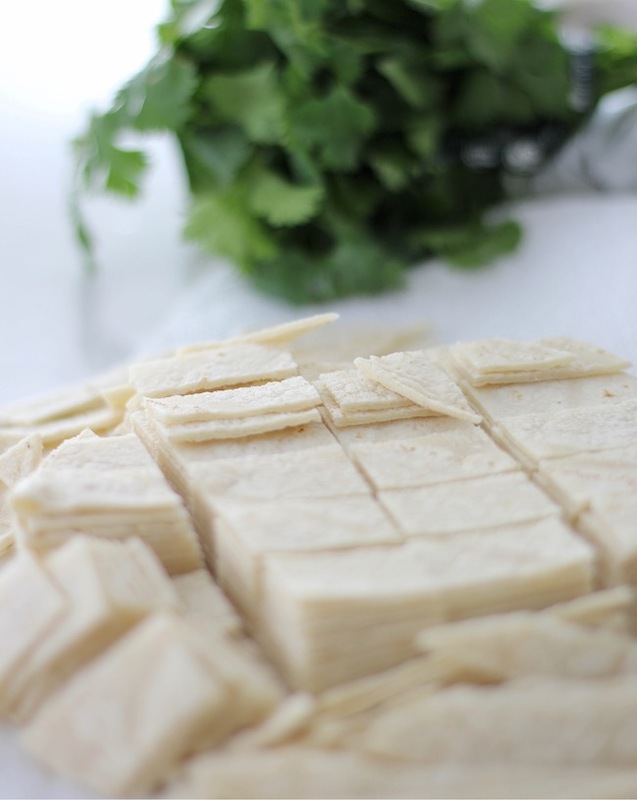 In preparing to make this enchilada meal, you’ll need to cut the 12 corn tortillas into bite sized pieces. It’s easily done by stacking them and slicing them into squares. Hand your family a serving spoon and let them take charge! There’s no wrong way to eat a skillet recipe. In a bowl or on a plate, just serve it warm and listen as the dinner table gets really quiet as everything starts scarfing! 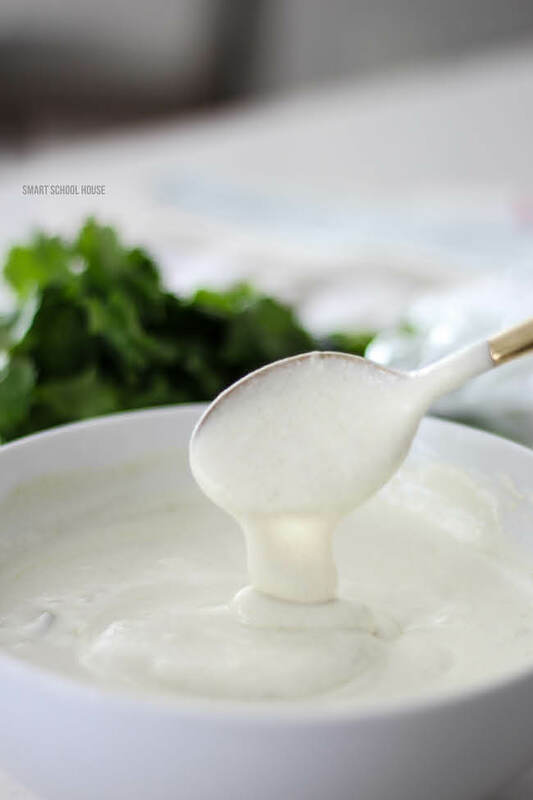 The spices of the green chilies and jalapenos combined with the creamy cheeses will have your family going back to this recipe time and time again. Nonstick pan or skillet with a lid. I prefer nonstick but cast iron and stainless steel will also work well.